System designers interested in understanding room acoustics, loudspeaker characteristics, and how they act in enclosed spaces are encouraged to attend SynAudCon’s “Sound System Design” seminar scheduled for April 3–5, 2017 in Miami, FL. Pat Brown, SynAudCon's president, will present an intuitive and comprehensive approach to sound system design that begins with analysis of the room’s acoustics. From there, attendees will learn how to select and place loudspeakers to achieve speech intelligibility and music clarity. In addition, Brown will cover loudspeaker sensitivity, power handling, and power amplifier ratings—which helps students learn how to get the most SPL from a loudspeaker as well as what size amplifier to use. He also includes how computer room modeling can be used to speed up the design process. Brown will use demonstrations and analogies to present the principles in a practical, visual, and understandable way. Attendees will leave with a knowledge of design principles that will give them confidence that a system design will work right from the drawing board. The seminar is approved for 24 InfoComm Renewal Units and includes SynAudCon’s "Audio Click-Rule" software program. 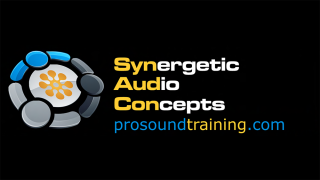 For more specific seminar and travel information, visit the SynAudCon at prosoundtraining.com and watch the short video.